The washed-rind cheese in front left is Clandestin from Fromagerie le Detour in Quebec. Behind it is Pecorino Crotonese from Calabria, Italy. In the upper right is the Ossau-Iraty from France. The small cheese in front right is Sheep in the Meadow from Ewenity Dairy Co-op. The blue almost out of the photo at right is Roquefort Papillon from France. Despite enjoying a long, rich history in Europe, the production of sheep’s-milk cheese in North America has never been prolific. Happily, Canadian cheese lovers can rejoice as the emergence of local sheep-milk co-ops has led to a resurgence of sheep’s-cheese making in Ontario. At her Night School for Cheese Lovers, cheese master Julia Rogers conducted a class devoted to sheep’s-milk cheeses last week. Unlike a class on goat’s-milk cheese that she delivered to a packed house—and perhaps speaking to the relative obscurity of sheep-milk cheese in Canada—this class was a more intimate affair, with only 11 students taking part in the tasting. As a newcomer to the study and appreciation of cheese, I was interested to learn the history of sheep-milk cheese. Humans have been raising sheep for their milk for more than 10,000 years. As self-feeding animals who aren’t the least bit picky, sheep have always been a low-maintenance choice for farmers. But sheep are sparser producers when compared to their other milk-giving peers; sheep give about one-twentieth the amount of milk cows produce, and they only lactate six months of the year. Despite these shortcomings, sheep’s milk has twice the fat and protein found in cow’s milk, making it a wonderful base for cheese. When the night’s tasting was finished, I was left with two favourites, representing completely different ends of the historical spectrum of sheep milk cheese, from the traditional to the emergent. Ossau-Iraty, an unpasteurized cheese from the Basque region of France, impressed me with its subtle flavours, clean taste, and its enduring finish. Julia spoke of quality versus intensity when offering this cheese, and she suggested that while its flavours might not blow the taster away initially, there are interesting, impressive dimensions to the cheese that make it a crowd favourite. The Basque region is one of the traditional bastions of sheep’s-milk cheese, having produced it for at least 5,000 years. 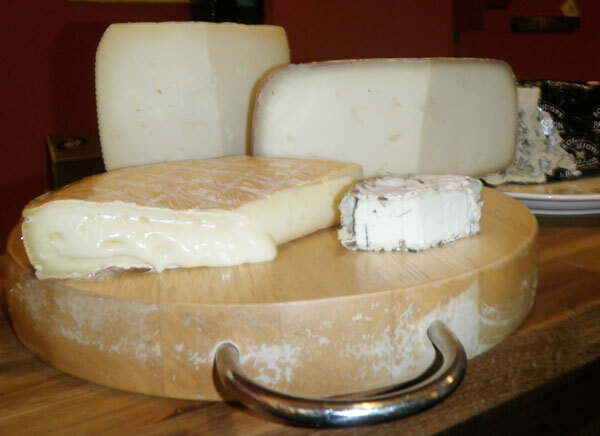 It is no surprise Basques produce such a fine offering. My other choice of the evening was Sheep in the Meadow, a semi-soft pasteurized cheese hailing from the cleverly named Ewenity Dairy Co-operative of Conn, Ontario. The bloomy rind was rolled in herbs, mainly rosemary and thyme. It was an earthy tasting, aromatic cheese. Founded in 2001, the Ewenity Dairy Co-op is a group of Ontario sheep’s-milk producers who banded together in order to ensure the sustainability of their business. Sheep-milk production in Canada is not a big business the way cow’s milk is, and 98 per cent of the sheep’s-milk cheese sold in North America is imported. But mindful, dedicated producers, like those affiliated with Ewenity, are helping to expand the sheep’s-milk industry in Ontario, and their work should warm the hearts of cheese fanatics. The small group who gathered in Leslieville Cheese Market West certainly left at the end of the evening with warm hearts and satisfied taste buds. A journalism graduate and budding turophile, Phoebe Powell last wrote for CheeseLover.ca about getting to know goat’s-milk cheese.